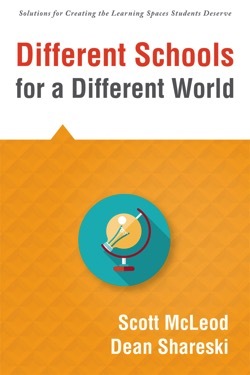 My new book with Dean Shareski, Different Schools for a Different World, is getting some positive early comments. A sampling is below. Thank you, everyone! 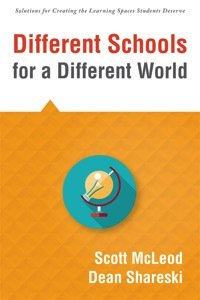 Different Schools for a Different World by Scott McLeod and Dean Shareski just hammered my thinking. Their work is not a long read. It’s about 60 pages. Don’t let that fool you. My favorite college professor, Dr. Ruth Slonim, once said, “Good writing is not when there’s nothing more to add, rather when there’s nothing more to be taken away.” This book is lean and dead on point. A literal wake up call. Scott McLeod and Dean Shareski have knocked it out of the park with their latest book. It’s practical with solid arguments and a length that every school administrator can manage, given their already-too-busy schedules. Outstanding work! 3. Silvia Tolisano is making motion graphics of quotes as she reads… Awesome! Information Literacy. If schools are to genuinely prepare graduates to compete in a technology-infused information landscape, they must stop acting as they did when learning and teaching primarily occurred in analog formats. 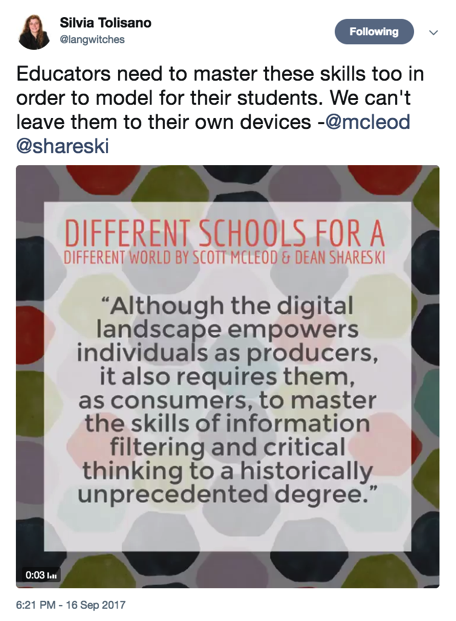 Instead, schools must begin to immerse students in the use of digital tools and in the outside contexts that surround those tools, and schools must do this in deeper and more significant ways. Workforce and Economy. 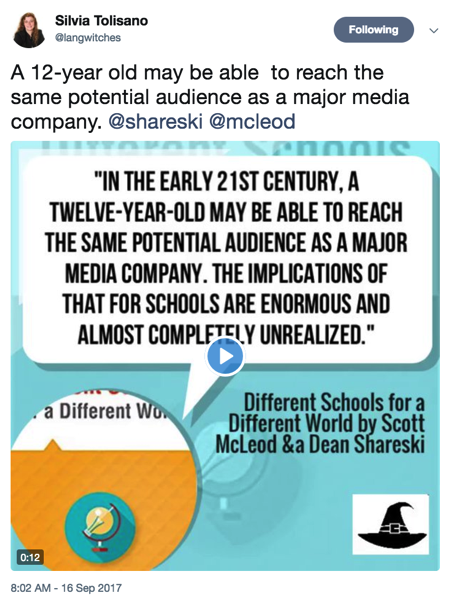 If schools are to genuinely prepare graduates for a hyperconnected and hypercompetitive global innovation economy, they must stop emphasizing low-level content coverage. Instead, they must focus on interdisciplinary thinking, interpersonal skills, and technological fluency: the skills that allow individuals to offer value and differentiate themselves in digital marketplaces. Learning. 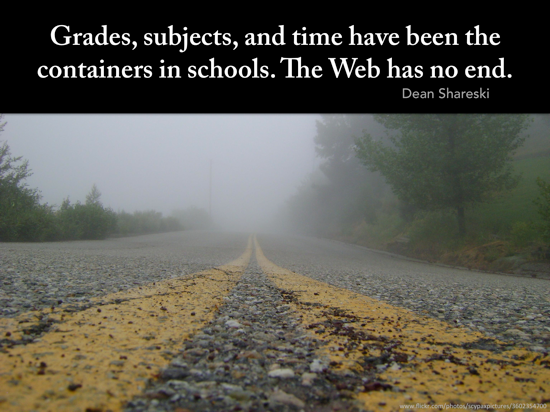 If schools are to genuinely prepare graduates to be powerful lifelong learners, they must stop blocking mobile devices, digital environments, and online communities out of fear, nostalgia, or concerns about maintaining control. Instead, they must help students learn how to utilize these tools to foster powerful learning and extracurricular connections. Student Engagement. If schools are to genuinely engage students in their learning rather than simply force them to comply with academic and attendance directives, they must move away from one-size-fits-all instructional models. Instead, they must find ways to make the learning opportunities students experience more relevant and personally authentic. Innovation. If schools are to genuinely prepare innovators rather than “just tell me what to do” workers, they must stop disengaging students by using extrinsic punishments and rewards to govern classrooms. Instead, they must transform their learning spaces into the kinds of engaging environments of discovery, play, and intrinsic motivation that reward innovation. Equity. And if schools are to genuinely address equity issues so that no child is truly left behind, they must no longer be content to provide exclusive access to technology and rich, creative technology education to those students who have the most advantages. 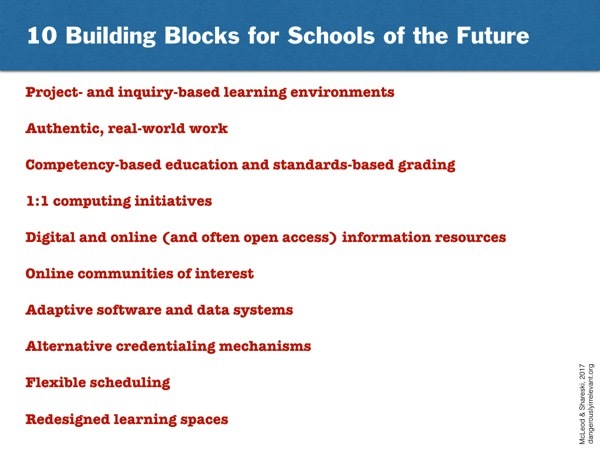 Instead, schools must find ways to enable robust digital learning for all students. 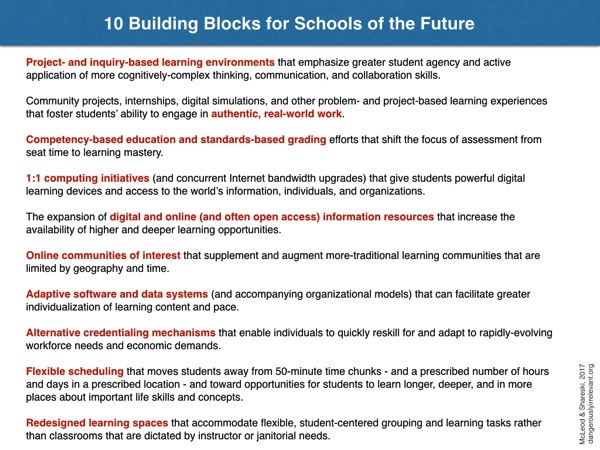 In the book we also note some strategies to address each of the relevancy gaps and highlight some schools that are doing well on the 4 big shifts of deeper learning, student agency, authentic work, and robust technology infusion. If you get yourself a copy of our new book, let us know what you think. Thanks. Happy reading! Here are a couple of Dean Shareski’s online promos for the DENny Awards… Happy viewing! I think the words were important but when it comes from someone who didn’t write them and it’s positioned as if it is, it becomes disingenuous and very pretentious. . . . [L]et’s advocate for student voice but not fake ones. Our students do have a voice. Most of them are childlike, full of child like ideas and most aren’t as eloquent as adults because they aren’t adults. That’s what we’re supposed to be doing, helping them develop that voice. Yet we do have some that are ready for prime time and we should provide ways for them to share. I know some districts have had students keynote. I think that’s great, as long as the core of their story is their own, not the districts or their teachers. I’d way rather listen to a student share a less polished message that was their own than using them like a puppet to further other adults’ agendas. Student voice without what Seymour Papert calls “kid power” is worse than empty rhetoric, it is a lie. . . . Too much of what is offered as “student voice” offers a false sense of agency, power, or freedom to the powerless. We need to stop putting words in the mouths of children and pretending that they’re theirs. It’s disingenuous and calculating and an insult to our youth. At 7pm Eastern on Monday, October 28, we launch the fourth and final Connected Educator Month book club. Contributors Joyce Valenza, Kevin Jarrett, Richard Byrne, Kristin Hokanson, and Stephanie Sandifer will join Chris Lehmann, Sheryl Nussbaum-Beach, and myself for a 1-hour online discussion of technology leadership issues. 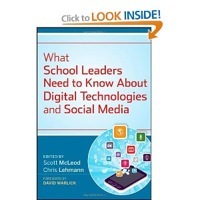 We will discuss topics from our book, What School Leaders Need to Know About Digital Technologies and Social Media, as well as anything else that we or our audience brings up. Please join us! At 7pm Eastern on Monday, December 2, our book club will conclude with a second webinar. Joining Sheryl and I that evening will be Doug Johnson, Steve Dembo, Dean Shareski, David Jakes, and Pamela Livingston. Hope you’ll join us for that one too! And, in between, we’ll be talking about the book in our online discussion space. Learn more about the book club and sign up to participate with us. See you online!